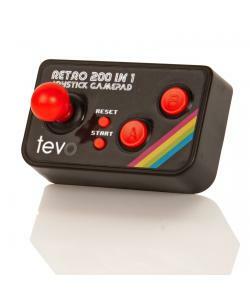 Play 200 retro games on your TV with the Tevo Mini Joystick Controller - compact and portable for hours of retro fun for all the family. The wired retro gaming controller features a mini joystick and A, B buttons. Simple plug in and play technology. 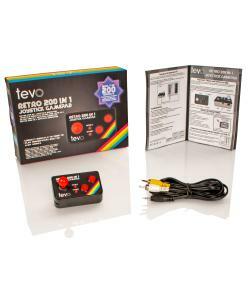 Just plug straight into your AV input on your TV for the ultimate retro gaming experience. With a range of games from shooting, arcade, puzzle and sports, there's a game for everyone from the 200 strong, on-board retro gaming library. Fun for all the family - Great for adults who want to reminisce or children to experience old school gaming. Remember way back when graphics were in 2D and old school arcade games were all the rage? Well now you can with the easy gaming gadget that plugs straight into your TV for the ultimate gaming experience in the comfort of your very own home! 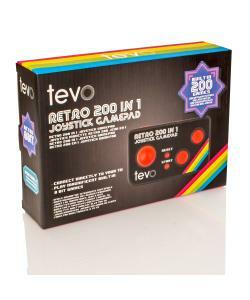 The Tevo Mini Handheld Controller is designed to look just like the retro 80s controllers. 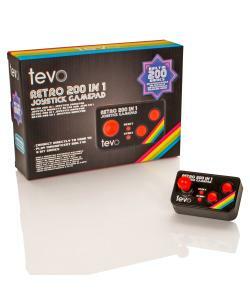 It's compact and portable for hours of retro gaming and is great for you and the whole family. With a range of games from shooting, arcade, puzzle and sports, there's a game for everyone. With a mini joystick and A + B buttons, this remote is a nostalgic little number for old-school gamers. Includes a 200 strong, on-board retro gaming library.Includes 1 x controller & 1 x connection cable. Batteries required: 3 x AAA (not included). Size H6.9, W4, D4.3cm.